Skulking about SoHo after the Trey Ratcliff book party for “A World in HDR,” I walked several blocks down Lafayette Street. Years ago this was a regular haunt for me. I often had meetings and business nearby, and just liked spending time in the neighborhood. But when you live in New York for 2-3 Decades as I have, neighborhoods move in and out of your life. I hadn’t been there in several years, and exploring it was an extreme mix of old and new. This store, “Etiqueta Negra,” really caught my eye. It is apparently a store and clothing line that originated in Argentina. I have no idea how long it has been in the current location. I shot a 7-exposure bracketed set, hand held, using a 24mm 2.8F prime. The low light capabilities of the D700 make this possible, and I have discovered that using the HDR function of Photoshop generates much less noise than does Photomatix (the downside its that it is slow and offers less customization. I had to manually pull in the windows from the darkest exposure, then I ran it through Lucis Pro and brightened the taxis a bit for some pop. Despite the low light, the D700 picked up reflections in the window of details from the buildings behind me. 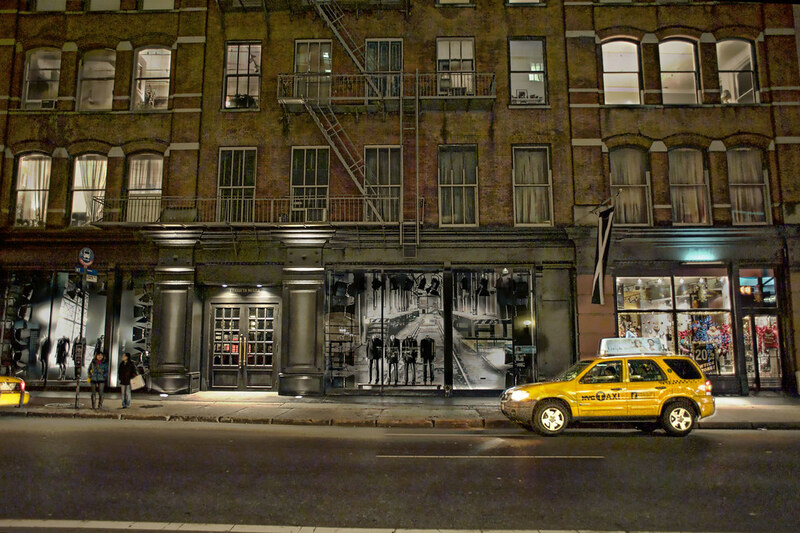 In the right of the window with the 4 headless male figures you see the inverse reflection of large letters TAR from a store called G-Star, and in the left of the same window you can see the reflection of the street number above the doorway of 270 Lafayette. Neither were really visible, or at least noticeable, to my eye when I stood there.